Tag Line: Execute Toshiro Histugaya! I went into Bleach the Movie 2, with higher expectations than I did going into the first Bleach movie. Perhaps that could attribute as to why Bleach the Movie 2: The Diamond Dust Rebellion felt as though it was lacking something. But for the sake of an honest review I will assess the movie as an individual. Standing alone, the movie works well enough as an adaptation of a popular Shonen series, you have all the boxes ticked. But the thing that both let’s the movie down and where it succeeds as a movie is the fact that it feels so unashamedly thrown together and rushed. This both works and doesn’t simultaneously, creating one completely frenetic movie with an unclear direction that will despite it’s problems manage to captivate you by it’s mystery and break-neck speed plotting. This particular brand of haphazard pacing and story line will be no stranger to fans of the series and undoubtedly warrant a watch from them. Is this a movie for everyone? Not in the slightest, but it is entertaining. The plot for the movie is the cinematic equivalent of a roller-coaster. One moment it’s up and within a flash it’s down. It’s all rather slapped together and will either really please fans or outright annoy them. 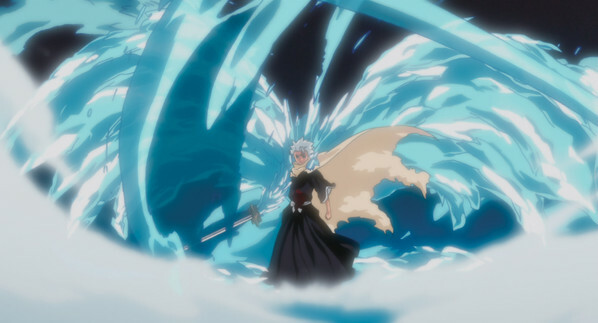 The movie sets out to create a back story for Toshiro Hitsugaya, one of the captains of the 13 Court Guard Squads. In doing so, it plays with Bleach’s expansive mythology in ways that fans will either love or hate. We get a new character introduced as a man from Histugaya’s past whom steals an ancient Soul Society artifact that is really poorly guarded considering how supposedly important the artifact is. This is all merely to create a villain for the movie and to give fan-favourite, Hitsugaya, the lime-light. 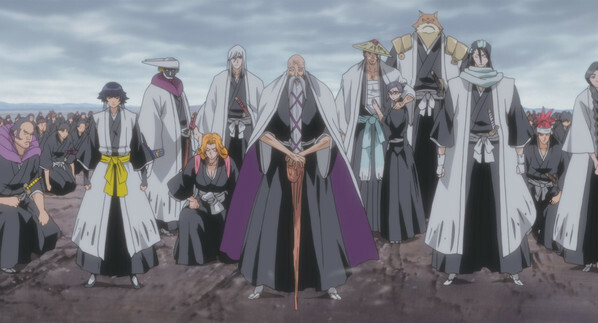 But for Bleach, all this chaos is cohesive and despite the unanswered questions, the experience is satisfying enough to be watchable, if not for anything besides the fights. Big sword vs. Small sword! Does size matter? As always with Bleach the sheer ammount of characters in this series is it’s undoing. There is well over 150 characters in this series and the creators like in Bleach Movie 1, feel compelled to cram in as many of them as possible. Some characters have good moments, however fleeting, such as Chad’s one scene wonder. But overall a lot of them served no purpose to the plot besides wasting time showing off each characters special moves. Time that should have been spent developing the plot. In general the character development was poor, the only character truly having any development being Hitsugaya. Which is to be expected since this movie was really just a glorified back story for him. The obligatory cram every single character into one shot-shot. Here is where movie succeeds. 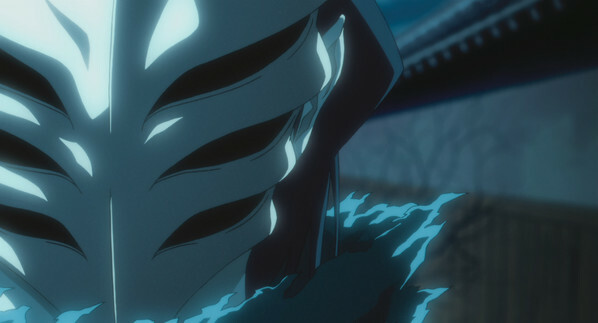 We have great flowing animation and Bleach’s artwork has never looked better. I don’t have any gripes with the artwork besides the fact that Kusaka’s final transformation looked cliche’d. But that isn’t enough to derail one of the shining spots of the movie. The designs of the new characters were well-done (asides from aforementioned’s final transformation). I particularly found the 2 Arrancar girl’s designs quite charming with their blades concealing behind their heads. Unfortunately their personalities weren’t as good. The battle scene’s were simply poetry in motion and the bankai special effects were all great. Overall a great job from the art and animation department for this movie. The face of evil… Obviously. The stand-out tracks of the anime series all appear here as well as some new made for movie tracks. I particularly enjoyed the theme song of the movie, “Hikaru no Rokku” by Sambomaster. It is a great track and fits the movie’s frenetic pacing perfectly. The voice work was all on par, however Steve Staley (Hitsugaya) was a little stiff with some lines but I a sure that is more to blame on some clunky dialogue and not his acting. 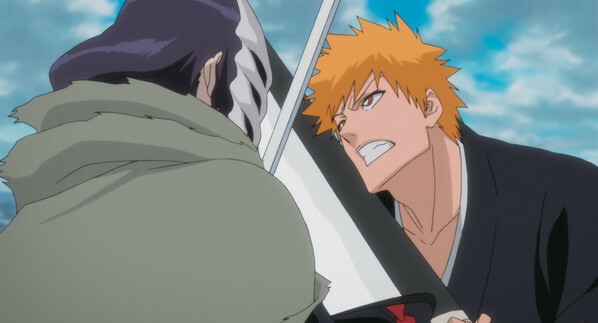 The MVP performance was as usual Johnny Yong Bosch as Ichigo Kurosaki. If there is any voice actor in this movie who challenges the original japanese voice actor, it is without a doubt Bosch. Like the previous movie, Madman has packaged it with a nifty information booklet with details on the characters, important terms and mythology of Bleach and general synopsis of the story. We are also treated to Viz Media’s usual DVD features such as production art, interviews and promo trailers of the movie. We also have Madman’s usual trailers for their releases. 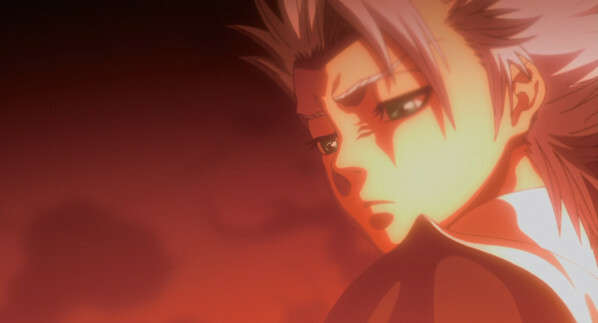 Don’t cry Toshiro, you won’t even remember this by next anime episode. 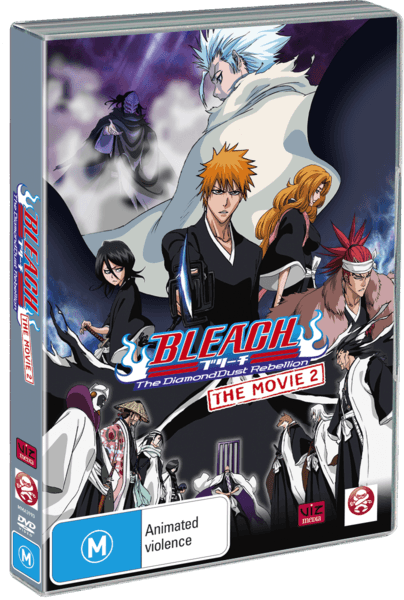 Bleach the Movie 2: The Diamond Dust Rebellion is a perfect example of where plotting goes wrong, but it still provides enough of an entertaining experience to warrant a viewing. The fight scenes are above par for Bleach and the regular characters hit all of their usual notes perfectly. If you can handle some dodgy pacing and a bit of confusion, or are just a fan of Bleach, give this movie a go. It is still a good watch, despite it’s downfalls and succeeds in being an entertaining 90 minutes of anime.